China expressed shock Wednesday at the Trump administration's decision to prepare 10-percent tariffs on another $200 billion of Chinese imports covering thousands of products, the latest move in an escalating trade war between the world's two largest economies. China's commerce ministry called the decision totally unacceptable and vowed to respond. The proposed new U.S. tariffs follow the decision to impose duties in two stages on $50 billion in Chinese goods. U.S. Trade Representative Robert Lighthizer said the Trump administration has patiently urged China to stop its unfair practices, open its market and engage in true market competition. "Rather than address our legitimate concerns, China has begun to retaliate against U.S. products,” Lighthizer said in a statement announcing the tariffs. "There is no justification for such action." 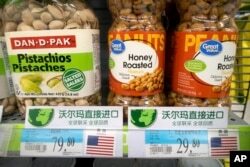 The proposed tariffs come just days after the Trump administration imposed 25 percent tariffs on more than 800 Chinese products worth about $34 billion, citing what it calls China’s unfair trade practices and intellectual property theft.Beijing followed suit with an equal amount of levies on U.S. goods. Christine McDaniel, a senior research fellow at George Mason University in Virginia, told VOA that while the Trump administration's actions have bipartisan congressional support, its strategy to date of tariffs and investment restrictions could be costly to U.S. manufacturers and consumers. "A tariff is a tax and in today’s global economy.American manufacturers are simply tied to suppliers from outside the U.S. for their competitiveness.So when we tax those imports, we’re taxing American manufacturers, not to mention consumers, and that heavily handicaps our own manufacturers." 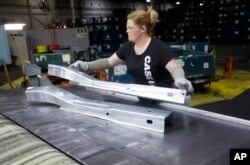 FILE - United Auto Workers line worker Crystal McIntyre unloads parts from a stamping machine at the General Motors Pontiac Metal Center in Pontiac, Mich., April 30, 2015. McDaniel said the longer the tariff battle goes on, the greater the impact will be felt in both economies.She added trade actions against China would be more effective if they were done in concert with America's allies.McDaniel also expects China to eventually change its policies away from state-owned enterprises and implement more market-oriented rules and regulations, but predicts that will take time. Despite bipartisan support, the Trump administration’s latest move drew criticism from House Speaker Paul Ryan, who is retiring at the end of his term in January. Ryan reiterated his opposition to the president's tariffs Wednesday, saying they "are not the right way to go." Ryan singled out China as one of a number of countries that engage in unfair trade practices, but added, "I just don't think tariffs are the right mechanism" to resolve the problem. But not all Republicans were skeptical of the president's move. Virginia Congressman Tom Garrett said, "They will lose, because right now we are importing about $5 of Chinese goods for every $1 we send to China. If they want to play this game, the Chinese economy will be hurt more." Congressman Chris Smith of New Jersey had a similar prediction. "If it does (retaliate), the Chinese government will be hurt. They rely on exports to continue their prosperity. They being the government. Where will they find markets like the U.S.? They are not going to find as many in the EU or anywhere else for their products." A high-ranking administration official said the U.S. Trade Representative’s office will accept public comments on the plan and hold hearings in late August, before reaching a final decision.